Playtika is one of the world's most popular mobile gaming companies, with a diverse portfolio of games, including House of Fun Slots, which offers free slots games with a genuine Vegas casino feel. Instant apps for Games allows Playtika to acquire new users, improve player retention, and increase average revenue per install (ARPI). Playtika prides itself on being one of the first to market on integrating new technologies. They saw instant apps as an exciting opportunity to allow players to easily enjoy the game and quickly get access, without the need to download the full version and go through the full process of installation and onboarding. 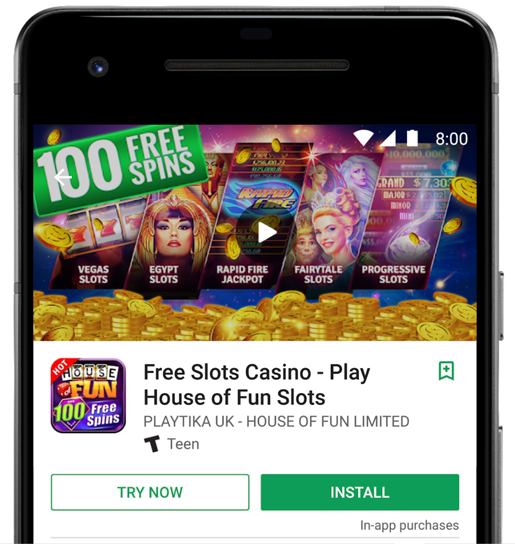 They built and launched an instant version of House of Fun Slots, which you can play by clicking the "Try Now" button on its Play Store listing. Playtika's development team was able to reduce the size of their House of Fun game from 79.3MB down to ~8MB, almost entirely by removing sections of code. With only a few small changes and in a quick turnaround, the game was ready to be playable instantly on Google Play. They also added a persistent install button to its instant app, and they reduced APK size by leveraging Android's progressive download tools. They then were able to start distributing the game via user acquisition channels and in-game social invites. "In order to get [the instant app] ready, we just removed stuff! Since it is the same APK we use for our standard app, we only needed to remove sections of the code that will not be used in the instant version. It didn't take us long and it was super easy getting ready for launch!" Players can now quickly get started and enjoy Playtika's game without the need to install the full game. This has led to higher player engagement and revenues from House of Fun's instant version, it has also encouraged to players to eventually downloaded the full game version. "We can already see an increase in players' retention and ARPI data. We expect to see those stats improve significantly once the amount of players increases. We eventually expect [the instant apps version] to exceed the number of the organic full version installs." Instant apps will be broadly available for games in the coming months. Sign up here to apply for the beta and receive more information as it is available.